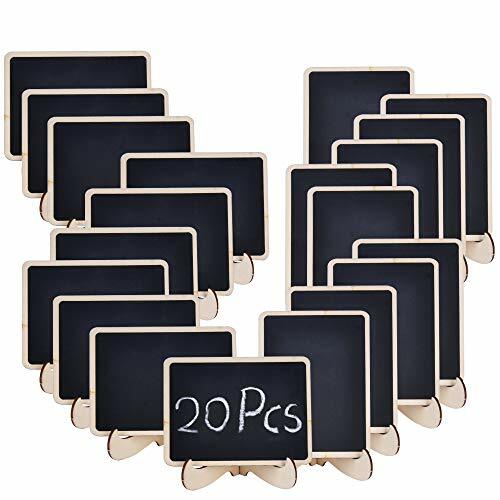 Package Includes 20 Mini Chalkboards, Size: 3.9*2.95in. Made by Natural Wood, Package Come Individually Wrapped in Plastic Bag Which Prevents Scratching and Damage. This Small Blackboard is Erasable and Reusable, Easy for Writing and Wiping, Can be Used Repeatedly After Wiping with an Eraser. You Can Place the Mini Chalkboard Horizontally or Vertically to Show Your Message and the Smooth Rectangular Design Balances it on the Stand. Great for Wedding Party Table Numbers, Place Card, Favor Tag, Plant Decorative Sign, Food Labels, Food Name Card Decorative Sign,Gift and Price Tags,as well as Kids Crafts etc.